This magazine is the answer. Some of the stories in it will be my own, retold for your enjoyment in fiction form by the finest writers of today. But many of the other stories will be favorites of mine, both new and old, written by the world's greatest craftsmen of the mystery - - such men and women as John Dickson Carr, Dorothy L. Sayers, Brett Halliday, Ray Bradbury, Craig Rice, Lawrence Blochman, all of whom you will find in this issue, and dozens of others who will appear in the issues to come. These stories, both new and old, will be the finest I can collect for your enjoyment. They will have mystery, suspense, inventiveness, color - - and above all they will be good reading, just as I try to make The Mysterious Traveler on the air good listening. 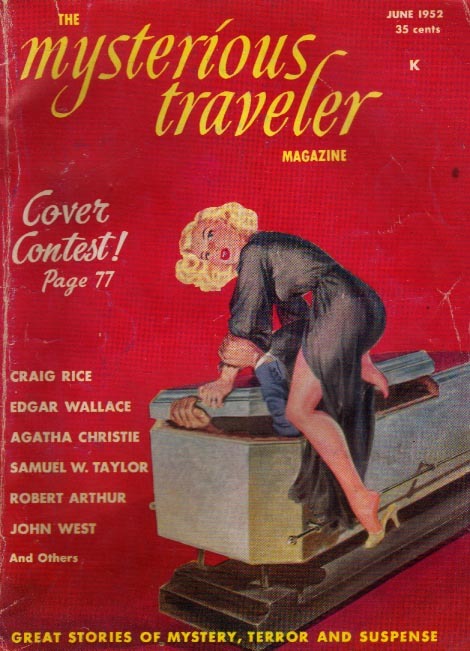 Thus begins the first issue of Robert Arthur's and David P. Kogan's joint venture "The Mysterious Traveler Magazine" of November, 1951. 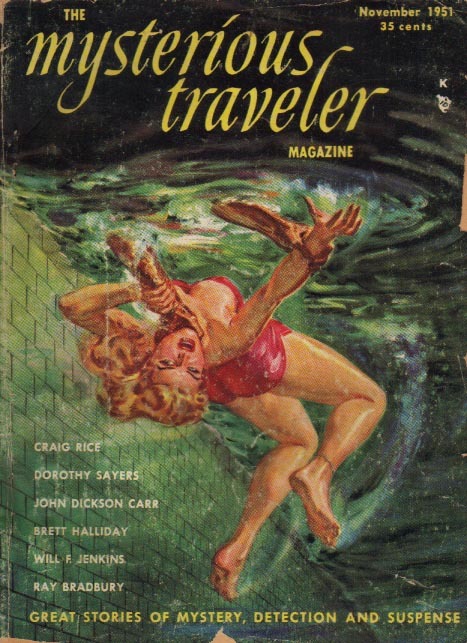 Based on their radio program "The Mysterious Traveler," this digest-sized magazine was published bi-monthly by Grace Publishing Co., Inc. of New York City at 35 cents a copy, annual subscriptions could be had for $2.00. David Kogan was credited as the Publisher and Robert Arthur was credited as the Managing Editor. The cover of each issue featured stunning artwork by Norman B. Saunders. Consisting of five issues, this short-lived magazine ended at about the same time that the radio program finished it's nine year run in September 1952. Each issue consists of twelve stories classified into various genres and sub-genres including crime, suspense, detection, mystery, strange stories, science fiction, terror, macabre, short shockers, etc. Some issues contain special features like contests and movie/book suggestions. 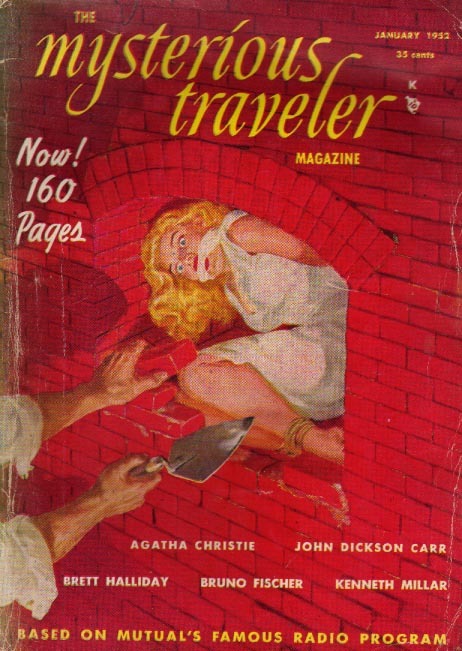 Each issue features at least one story by the Mysterious Traveler (Robert Arthur) himself plus stories by some of the most well-known writers of the day including Ray Bradbury, Dorothy L. Sayers, John Dickson Carr, Craig Rice, Sax Rohmer, Agatha Christie, Cornell Woolrich, August Derleth, Brett Halliday and others. As many as seven stories in each issue were penned by Robert Arthur, most under various pseudonyms. Volume 1, Number 1, November, 1951. - An ad for the Mysterious Traveler Radio Program on the back cover. Volume 1, Number 2, January, 1952. - A Contest: Readers could send in an outline of a mystery story based on this issue's cover art. Grand Prize: $50.00, ten runner-ups would receive a free year's subscription. Volume 1, Number 3, March, 1952. Volume 1, Number 4, June, 1952. - A Contest: Same idea and prizes as in previous issues. - A whole page listing prize winners and the entry statistics for the contest featured in the January issue. - "The Mysterious Traveler Suggests . . .": A two page section promoting four Radio Programs (The Black Museum; Crime Fighters; Crime Does Not Pay; Under Arrest! ), two books (Fancies and Goodnights by John Collier; The Best from Fantasy and Science Fiction edited by Anthony Boucher and J. Francis McComas), and two movies (The Green Glove; Five Fingers). Number 5, 1952. No volume or month listed (probably September). - Many changes to the format including a change in the magazine's title and font from "The Mysterious Traveler Magazine" to "The Mysterious Traveler Mystery Reader". I find The Mysterious Traveler Magazines interesting on a number of levels. Robert Arthur edited and contributed his short stories to dozens of different magazines but he had a personal stake in this magazine and it offered him the opportunity to publish many of his own stories (at least twenty-one of them) within a relatively short period of time. As best I can ascertain, most if not all of these 21 stories were aired on The Mysterious Traveler Radio Program in one form or another. They often had to be edited or modified in some manner to fit the format of the radio program, but what you'll find in the magazines are the original versions of the stories. David P. Kogan was Robert Arthur's partner on The Mysterious Traveler Radio Program and Kogan is credited as "Publisher" in The Mysterious Traveler magazines. I'm not sure exactly what his duties with the magazine entailed. Unless his writing was published under pseudonyms, none of his writing appears in the magazine. Perhaps he was the owner of Grace Publishing and fronted the money for the operation. Further research is necessary. There is little doubt that as Managing Editor, Robert Arthur was deeply involved in the day-to-day operations of the magazine and that he wore many hats to ensure it's success. My early suspicions that the magazine was primarily a Robert Arthur creation were largely confirmed by Elizabeth Arthur. 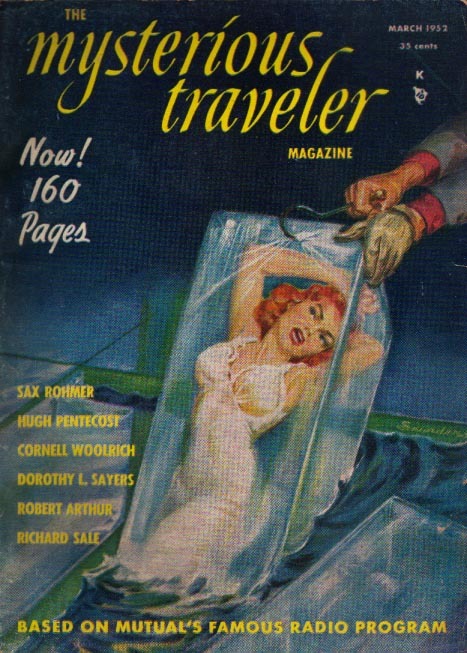 Robert Arthur chose which stories were to be included in the magazine and he wrote the short introductions to each in the voice of The Mysterious Traveler. He most likely was the one who corresponded with the contributing authors or their agents and negotiated any terms with them. Arthur also wrote the lengthier introductions to the magazine found at the beginning of the first four issues. Arthur designed the "Cover Contest" featured in three of the issues and it was probably he who waded through the hundreds of entries received and awarded the prizes. I suspect that he also invested a lot of personal time in trying to get good distribution of the magazine and increase it's sales. The first issue of The Mysterious Traveler magazine is 144 pages in length. The Mysterious Traveler urges readers to write in and let him know what they like and/or dislike about the magazine and to offer any suggestions about it's content. Based on suggestions by readers, Issue #2 is expanded to 160 pages and features a contest to get readers involved in and excited about the magazine. Issue #3 is similar to the second issue. Issue #4 is, in my opinion, the high-point of the magazine as it features seven Robert Arthur-penned stories and contains two pages detailing the results of the January cover contest. Two of the stories in this issue ("Pigeon's Blood" and "Case of the Murderous Mice") are of particular interest to Robert Arthur fans as they were later re-written and included in the large hardbound children's anthology: "Alfred Hitchcock's Solve-Them-Yourself Mysteries". There are sudden changes with the final issue, #5. Most of these changes are likely due to the fact that The Mysterious Traveler Radio Program ended it's long successful run at about this time. The page count has dropped to 130, the title has changed to The Mysterious Traveler Mystery Reader, there is no page-long issue introduction by The Mysterious Traveler (although the short intros to each story remain) and all references to the Mutual Broadcasting System and it's back page ad are gone. For you collectors, it is correct that this issue begins with page "3". Norman B. Saunders, whose artwork graces the covers of all five issues, was a prolific artist whose work was used on hundreds of pulp magazines. His work is highly sought after by collectors today. 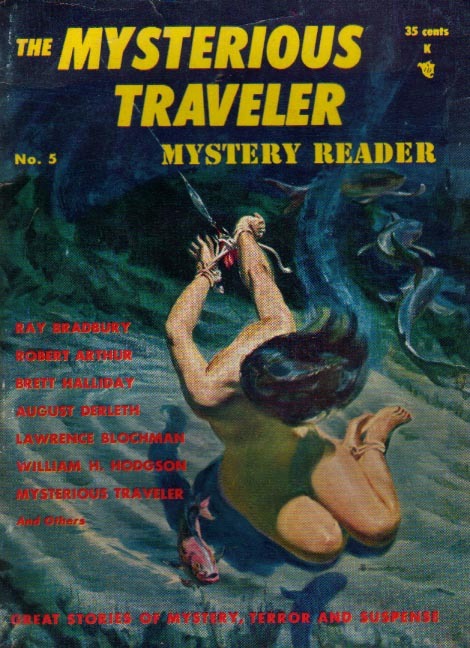 The Mysterious Traveler magazines can occasionally be found on eBay auctions or from used book dealers on-line through ABEbooks or Amazon. Depending on condition and your luck, they can be purchased anywhere from $5.00 to $50.00 per issue. The original news-stand price was 35 cents per issue. Return to the Robert Arthur page. Now on-line and FREE: The Mysterious Traveler E-zine. Page researched and created by Seth T. Smolinske.